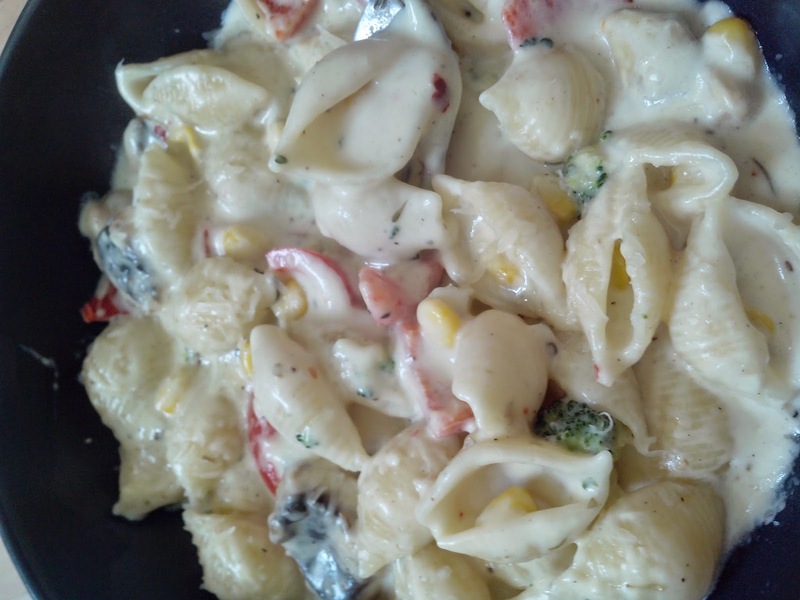 Pavi's Platter: Pasta in White Sauce ! I am meeting you today with a mouth watering and delicious recipe.. 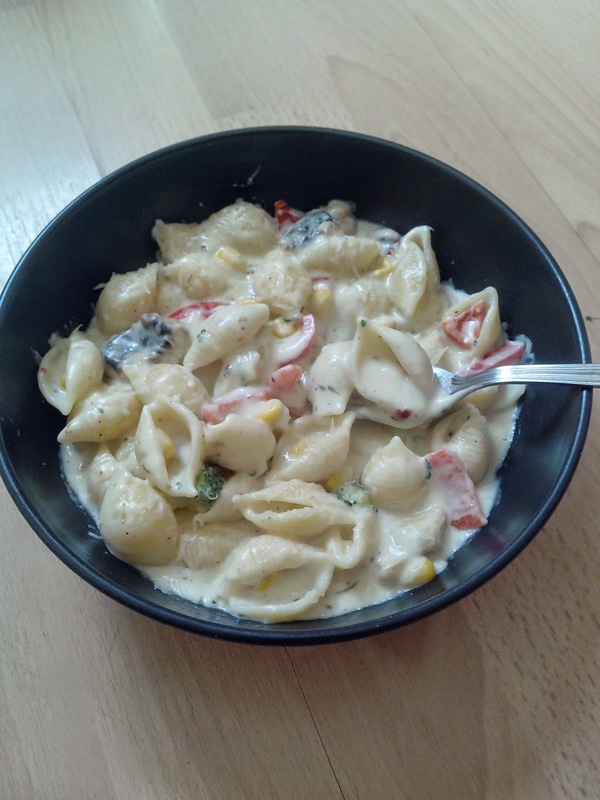 Pasta in White Sauce. White sauce is actually called ALFREDO sauce.. invented by Alfredo Di Lelio and his signature dish Fettuccine Alfredo named after him. The actual recipe is very simple with just three awesome ingredients which makes the dish heavenly.. BUTTER.. CREAM... PARMESAN. These three makes the original alfredo sauce and the cooked pasta is tossed in it. But it is highly calorific and the sauce is being modified variantly across many countries. 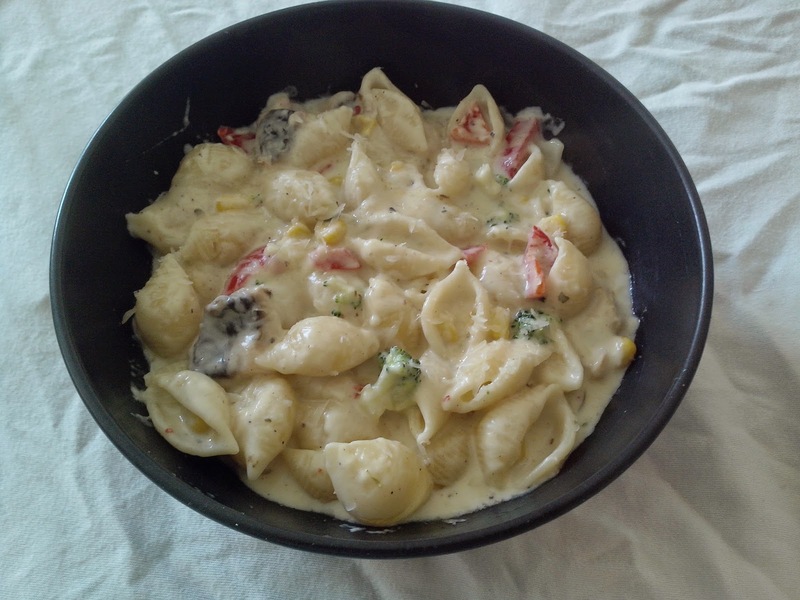 As a low calorie alternative to the original alfredo sauce , milk + flour is used in place of the cream. I have used both milk+flour and also a little cream instead of using only cream for the recipe. As a substitute for Parmesan, cheddar cheese or shredded Mozzarella cheese can be used. But parmesan tastes definitely unique. Boil the pasta in salted boiling water with a tsp of oil so that they don't stick. Stir in between until it is cooked al-dente (cooked firm). Mix 1 tbsp of maida (all purpose flour ) and little milk and keep ready. Adding vegetables to this dish is purely optional as just the pasta with this sauce tastes delicious. 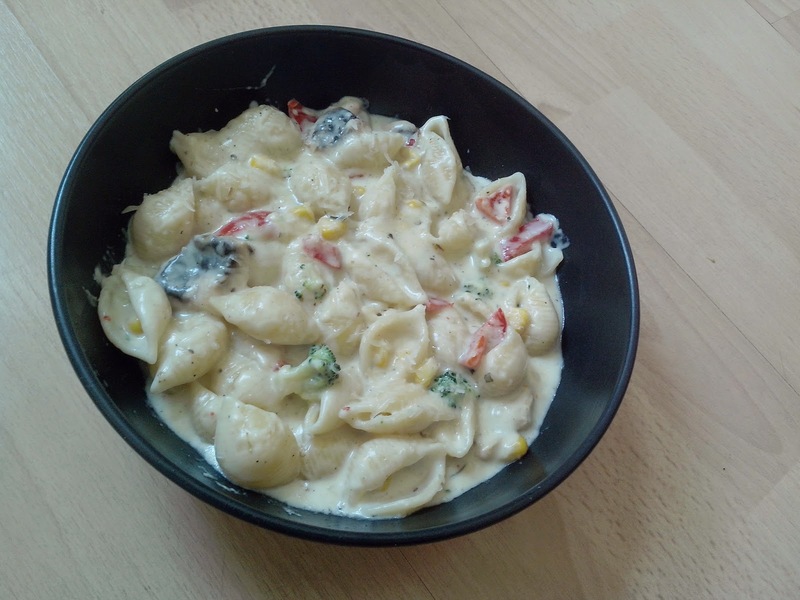 But no harm in adding a few colorful veges.. if not for the vegetables just the sweetcorn and mushroom blend well with the white sauce. I microwaved the corn and broccoli until they are cooked. You can cook them in boiling water too. Heat a pan and add a tsp of butter. Add the roughly chopped mushrooms and saute till they leave water. Add the red bell peppers, and saute for another minute. Now add the cooked broccoli and corn. Sprinkle some salt and toss for a minute.Transfer to a plate and keep aside. In the same pan, add more butter and once it melts pour in the flour-milk mixture and stir well. Keep the flame very low as it will thicken very soon and tend to form lumps. Add the remaining milk and keep stirring..the flour gets cooked and the sauce thickens. Cook for a minute or two on low flame and then add a pinch of dried herbs. Mix well and switch off the flame. See you soon with another delicious recipe. With reference of your article I have the pleasure to tell you the history of my grandfather Alfredo Di Lelio, who is the creator of “fettuccine all’Alfredo” in 1908 in restaurant run by his mother Angelina in Rome, Piazza Rosa (Piazza disappeared in 1910 following the construction of the Galleria Colonna / Sordi). This trattoria is “the birthplace of fettuccine all’Alfredo”. See also the site of “Il Vero Alfredo” (in which there are also news about franchising) . I must clarify that other restaurants "Alfredo" in Rome (as Alfredo’s Gallery or Alfredo alla scrofa) do not belong to the family tradition of "Il Vero Alfredo" in Rome. THanks for stopping by and leaving this valuable info. Very glad to know the history of ALfredo sauce. Being an Indian i have a love for Italian and will definitely visit Il Vero Alfredo when i come to Italy.